Create five forces chart quickly without hassle with a powerful diagramming solution. Learn how to make visually striking five forces charts. The Porter's Five Forces tool is a simple yet powerful tool for understanding where strength lies in a business situation. This is useful, because it helps you figure out both the strength of your current competitive position, and the strength of a position you're considering moving into. 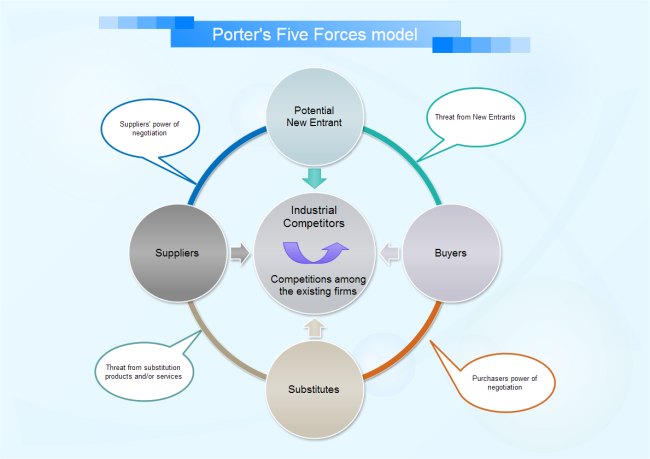 The five factors in Porte's five forces chart are buyer power, supplier power, competitive industry rivalry, threat of substitute and threat of new entry. This analysis tool can be used for the following purposes. 1. It is a strong tool for competitive analysis at industry level. 2. It helps to make a qualitative evaluation of a firm's strategic position. 3. It helps to assess a new industry's attractiveness and growth opportunities. 4. It helps to develop effective strategies to raise the profitability, power, and competitive position in an industry. You can have a wonderful solution not only for five force chart but also many other kinds of diagrams, right here. Edraw Max is aimed at serving as a comprehensive full-featured diagramming package, helping users to get professional-looking infographics in the fastest and easiest way. It can achieve this goal for the following features (see the next section). Firstly, check out its user-friendly interface similar with MS Word. A comprehensive diagramming package that can produce over 200 kinds of diagrams in addition to five forces charts. An extensive collection of symbol libraries that include 8000+ shapes and are ever-expanding. Some ready-made templates for quick start. Automatic formatting tools that can greatly improve and accelerate diagramming. Seamless integration with MS programs and many other kinds of application. A set of specialized five force chart symbols are offered for immediate use. They are all easily editable, highly scalable and color changeable. The attached floating action button allows users to make adjustment to the shape effortlessly. Click here to learn how to make five force chart. This diagram can be used as a highly artistic display of five forces of a certain company. Users can get started as quick as lighting by just typing in their own contents. In the current fast-paced society, it is quite necessary to seek for an efficient way to do things. Edraw Max offers a feasible and fast solution for five force charts, saving users time, energy and money. 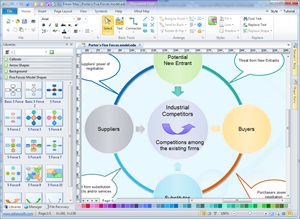 It is definitely an ideal choice to create diagrams of all kinds.